Next up for Kate is the premiere of an all female three hander, Silence by Nicola Werenowska, a fascinating new play set between Warsaw and London and three generations of a Polish/British family. A co-production by Mercury Theatre Colchester, Unity Theatre Liverpool and Wiltshire Creative for Salisbury Playhouse it includes week-long runs and a short UK tour. Having trained with the NYT and Bristol Old Vic Theatre School over 35 years ago, Kate’s wealth of experience ranges from Fringe to Regional Repertories, the RSC, National, Broadway and West End stages as well as Film, TV, Radio, Commercials and Corporate work. As a skilled and natural improviser Kate also works as an actor in business and is a Communication Skills Coach & Facilitator. 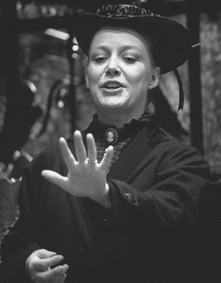 Her leading theatre roles include the unwitting feminist Nora in Ibsen’s The Dolls House (Basingstoke Haymarket), the bluntly outspoken Derbyshire stalwart Maggie in Hobson’s Choice (Derby Playhouse) and the delusionary and faded Southern States belle Amanda in Tennessee Williams’ The Glass Menagerie (New Wolsey, Ipswich), for all of which she received outstanding reviews – see Review Section. Kate’s transformative power as an actress translates equally from highly emotionally charged individuals to finely tuned comedy characters. Her versatility has earned her extensive experience in theatre with the RSC in Good (Aldwych Theatre and Booth theatre, Broadway) and Les Liaisons Dangereuses (Ambassadors Theatre) each directed by the late Howard Davies and Bartholomew Fair (dir. Richard Eyre) and The Shaughraun (dir Howard Davies) both on the National’s Olivier stage. With experience of leading roles by Shakespeare, Sophocles, Ibsen and Ayckbourn and contemporary writers including Stephen Jeffreys and RSC writer, Fraser Grace, Kate has worked up and down the Country at theatres including The Orange Tree, Theatre 503, Chichester Festival Theatre, Derby Playhouse, Exeter Northcott, Plymouth Theatre Royal, Cheltenham Everyman and Bristol Old Vic Theatre. Kate’s screen presence includes TV ranging from soaps such as Doctors, Holby City, The Bill, Eastenders and Brookside to TV drama, Down to Earth to Greek tragedy, Oedipus at Colonus & Iphegenia at Aulis. Her film work includes An Ungentlemanly Act with Ian Richardson & Ian McNeice, Natural Lies directed by Ben Bolt and To Be The Best with Anthony Hopkins. Short films include I wouldn’t wish the Eighties on Anyone, Dignity and the thriller book trailer, The Farm (see showreel), all evidence that Kate’s transformative skills have led to a wonderfully various range of parts on screen as well as stage. At the head of this one-parent family is Amanda. In Kate Spiro’s remarkable performance she is a luminous visionary within a world where a secretarial course or a gentleman caller are all her daughter can hope for. Amanda, with her lubricious monologues, is one of those pesky belles who resolutely refuse to fade. 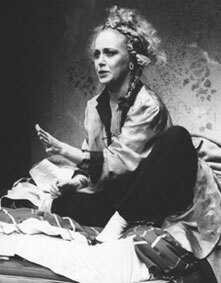 Kate Spiro gives a hint of what Broadway, with actresses like Laurette Taylor and Uta Hagen, must have been like. We will be lucky to see a better performance this year. There’s the family matriarch Amanda (floridly and bitterly played – though not without comedy – by Kate Spiro). She, the deserted and faded Southern belle hating the St Louis tenement they live in, is caught between her illusions and often-repeated memories and the harsh, practical world with which she has to deal…For me this is one of those must-see plays. It gets a good treatment here. …Maggie his wife, played by Kate Spiro was brilliant. 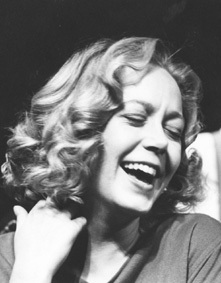 She delivered her performance, at once both severe and comic, with an unsurpassed understanding of the character. …Kate Spiro quite astonishingly conveys the doomed Louisa Gradgrind’s telescoped transition from girlhood to womanhood and the human breakdown induced by a life of inflexible logic. …But the evening belongs to Kate Spiro whose blistering portrayal of Louisa Gradgrind has forever banished my impression that all heroines in Dickens novels are simpering wimps. …Kate Spiro’s ‘Ofelia’ grows in substance. Her madness is ingenuous and very moving; everything has broken up inside her; the songs and riddles that burst from her mouth are splinters of what used to be a person. A radiant Ofelia, Kate Spiro reveals a tuneful mezzo in her madness scene which she plays without the usually embarrassing whimsy or sexual abandon. 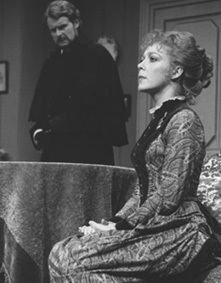 …Kate Spiro in full mourning and of dignified presence as Olivia, giving a remarkable change of character in her translation from sorrow to joy.